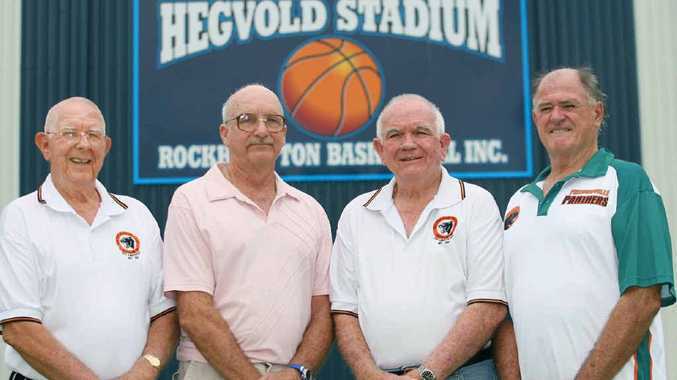 BETWEEN them there is more than 200 years experience in Rockhampton basketball, making it little surprise that when Frank Haack, John Hegvold, Brian Smith and Barry Brady get together, one of the topics of conversation is going to be basketball. While memories are of the past and occasionally regrets are felt that some things have changed, the four are still firmly committed to their sport and the direction it is taking. With each one of them involved in basketball for more than 50 years it is obvious they have seen changes, many of which they have helped to start. When it comes to changes in local basketball there is little comparison between the game the four played when they joined the Panthers during the 1950s and what the public views when they go to Hegvold Stadium to watch the Rockets or the Cyclones. For Frank the big difference is the size of players. "Things have changed genetically," he said. "When we played we were the tallest players." "It is not just over here but America too." At 191cm (six foot three inches) Frank is not a small man but today the average height of a player in the NBL is far greater and with the improvements to diet and other lifestyle issues it keeps rising. Consequently there is little reason to compare the best today with the stars of yesteryear. "One thing that would kill us is the size," they agreed. All four are very proud of the achievements of the Panthers club in the development of basketball in Rockhampton. "Panthers is the only club (from when they played) that still exists today," John said. When talking about the old days there is usually reference made to the quality of facilities. Needless to say there has been a marked difference in what the quartet were used to during their playing days. "We used to practise at 6am on outside courts," Brian said. "We trained for three hours starting with the fundamental skills." Starting at that early hour did produce a benefit as they recruited fellow early risers Graham Black and Barrie Brady who were out to train for tennis. After playing, outdoors and in church halls, which were woefully inadequate for playing basketball, the sport began to move ahead in the early 1960s when there was the first development of the area where Hegvold Stadium now stands. The four remember the work done by volunteers in building the changing facilities at Hegvold in 1962, the help from the headlights of people's motor vehicles to complete marking of the outside courts in preparation for a state tournament and the grand opening of that facility in December 1962. On the playing scene the visit of the world-famous Harlem Globetrotters to Rockhampton in 1961 was special. The games were played on a laid court at Browne Park and all four were impressed by the quality of their opposition. "JC Gipson came over to us in his street clothes and asked if we had a basketball," Frank said. "He then slam dunked from a standing position." While that was impressive the coaching Frank received on how to play a hook shot also left a lasting memory for him. "You ain't got no rhythm man," he was told. Hegvold Stadium named after his father Eddie, a well-known Rockhampton architect. In 1962 John was the first Rockhampton player to represent Queensland at the Open Men's National Championships. Awarded the Australia Medal for service to Rockhampton basketball, an award that has a special place amidst his other awards gained locally. Author of "Basketball in Rockhampton in the 20th century", Brian still works as a volunteer for the sport. Currently an RBI board member. A life member of RBI since 1977. The current vice-president of RBI. Represented Queensland at Men's Open National Championships. Frank still coaches skills locally and has been the assistant coach of a number of Rockets and Cyclones teams. A life member of RBI since 1998.